Runtime: 1 hr. 30 mins. With a running length of 30 or 40 minutes, Isle of Dogs might have been brilliant. Unfortunately, this concept, although suitable for a short, is too thin for a full animated feature. Wes Anderson's sly humor, like the film, wears out its welcome long before the end credits arrive. With a minimalist narrative, Isle of Dogs has to get by on the strength of its visuals, the effectiveness of the voice casting, and the ticklishness of the comedy. While the movie can boast the first of those three qualities, it stumbles on the other two. The cast is too stuffed with familiar names and voices that it at times becomes like a game of "guess who's talking now." And Anderson's screenplay, while replete with chuckle-worthy moments, loses a lot of steam during the second half. As with Anderson's previous animated effort, 2009's Fantastic Mr. Fox, this is geared more toward older kids and adults than grade-schoolers; as such, it's not really a "family film." Isle of Dogs' stop-motion animation is every bit as enchanting as Fantastic Mr. Fox's. For the most part, actions are smooth and animation is the perfect medium for a story about anthropomorphized dogs. 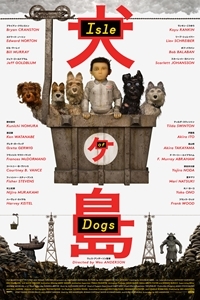 However, while Fantastic Mr. Fox had the benefit of being based on a novel by Roald Dahl, Isle of Dogs is based on a story by the buddy trio of Wes Anderson, Roman Coppola, and Jason Schwarzman (with Kunichi Nomura as an added collaborator). The difference in the quality of material is evident. Is the movie allegorical? Almost certainly, since Anderson isn't known to be shy about his political views. The story, about an authoritarian official deporting a population of undesirables to a concentration camp-like setting, eliminating his rivals through nefarious means, and using fear to stoke the fires of popularity for his agenda, isn't subtle about its real-world "inspiration." Even though the setting is a near-future dystopian Japan, Anderson is using the age-old approach of employing science fiction/fantasy elements to comment on current-day issues. In Megasaki City, a dog flu virus has become a major problem. With a large portion of the canine population sick, something has to be done. Although scientist Professor Wantanabe is close to a cure, the mayor, Kobayashi (Kunichi Nomura), determines that the best solution is to banish all dogs to Trash Island - starting with Spots (Liev Schreiber), the pet of his ward, Atari (Koyu Rankin). The scene shifts forward into the future. Many of the once-pets of Megasaki City now roam the wasteland of Trash Island, where food is scarce and survival of the fittest it the way of life. Five alpha dogs - Chief (Bryan Cranston), Rex (Edward Norton), King (Bob Balaban), Boss (Bill Murray), and Duke (Jeff Goldblum) - have banded together to forge ahead. That's when a small aircraft, piloted by 12-year old Atari, crash-lands. He has come in search of Spots and the dogs agree to help him in his quest. Chief, who is initially wary of contact with humans, eventually forms a bond with the boy. Meanwhile, in Megasaki City, Kobayashi has Atari declared dead and prepares to euthanize all the dogs on Trash Island to fulfill a campaign promise. Isle of Dogs isn't without moments of cleverness, both visually and in the dialogue. The film's central relationships, however (in particular, the boy/dog friendship that develops between Atari and the stray Chief), lack the emotional strength to elevate them to a level where we actually care. Without that emotional connection, much of Isle of Dogs feels like an exercise in technique. Viewers can appreciate the quality of the animation, guess how many famous voices they can identify, and laugh at the jokes, but those things represent a purely intellectual appeal, which makes it feel like something is missing. Isle of Dogs isn't as freewheeling as some of Anderson's more oddball live-action films (like, for example, The Life Aquatic with Steve Zissou or The Darjeeling Limited), but neither is it as grounded and well-developed as Moonrise Kingdom or The Grand Budapest Hotel. The nature of the comedy is the same but Isle of Dogs is in need of a stronger storyteller. And, yes, there are times when the cleverness starts to feel smug. I would have liked Isle of Dogs more if there had been less of it.